Triangle shaped, round or square “Yuk Zong” (肉粽 in Cantonese), my favorite pork meat glutinous rice dumplings are filled with various fillings, wrapped in bamboo or lotus leaves. Zongs come in various shapes, sizes and tastes (sweet, savoury, spicy and a mixture of it all) according to regions or states in Malaysia. Whenever someone ask what Zong is, I would always happily explain what ingredients are required to make this truly authentic and traditional recipe. Welcome to Malaysia, a land where everything is of a mixture (Malaysians refer to this as Rojak): the people, the language, the newspapers and the food culture all mix naturally. Though the origins of Zong, points to Southern China, this heritage food is also well acclaimed across the Malaysian Chinese communities; the Kuala Lumpur (Cantonese speaking KL-ites) refer to it as Zong, the Northern Penang name it Bak Chang in the local Hokkien dialect and the Baba-Nyonya Peranakan call this dish Chang. Important and interesting, it is the meaning and story or Chinese folklore behind Zong that leave an impression. The Zong / Dumpling Festival (Cantonese: Tuen Ng Jit / 端午節) is celebrated on the fifth day of the fifth lunar month, June 23 this year 2012. It honours a famous and successful scholar-poet Qu Yuan who took his life by jumping into a river after the fall of the Qin Dynasty to the Zhou Dynasty. He was greatly saddened when the king refused to take his advice, leading to a great war. 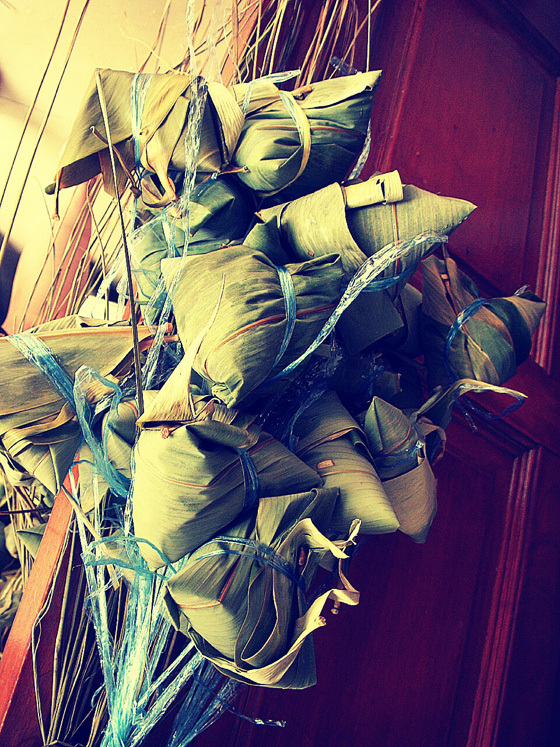 It is said that the local people, who admired Qu Yuan, dropped sticky rice triangles wrapped in bamboo leaves into the river to feed Qu Yuan in the afterlife. The paddling of the boats in those days apparently were meant to scare the fishes away (in modern today we have the famous Dragon boat racing). Another, equally convincing, folklore explained: fearing that fishes would eat Qu Yuan’s body, friends and supporters had made dumplings and threw them into the river so that the fishes would eat them instead of the body. Hence the dumplings Zong was given birth. – Ham Yuk Zong / Yuk Zong ( 肉粽): Salty Meat Dumpling typically filled with fatty pork belly, yellow mung beans, salted egg yolks, mushrooms and my favorite chestnut. – Nyonya Zong (娘惹粽): A specialty of Peranakan cuisine, the fillings are minced pork with candied winter melon, ground roasted peanuts and taucheo (Chinese soy bean paste made from yellow soy beans). Traditionally the dumpling has a bit of blue rice coloured from the butterfly pea flower. – Kan Sui Zong (碱水粽): Literally translated as “alkaline water Zong”, this is a dessert item or a snack for tea time. The glutinous rice is treated with lye water hence the distinctive yellow color. It is usually plain, with no filling and if there are it is a sweet stuffing, for example red bean paste. 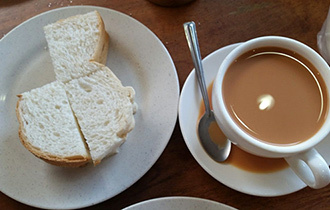 It is often complimented with sugar, gula melaka (Malay for palm sugar) or a delicious local coconut spread named kaya. Zong today, in my view is considered a forgotten food and recipe in Kuala Lumpur. Through my observations there are many chicken rice stalls but very few Zong stalls around. And how many Zong stalls serve a decent Zong? To be honest not many in KL. The most delicious Zong sold around KL would be freshly homemade from generation old family recipes, which have been passed on from moms or grandmas. That was indeed how I acquired and learnt how to appreciate Zong: through a traditional family secret recipe and ritual since I was 11 years old. It was really satisfying, as i recalled back to those days, the family’s team spirit and hard effort making Zong. Every bite of the Zong was simply delicious, flavorful with all the pork meat and fat melting away and simply filled with lots of love. The process of making it is truly an art and takes many cumbersome steps, from purchasing various ingredients, preparation to frying, folding and steaming/boiling them. There were always a lot of fun, jokes, laughter and gossips with and about the entire family. Never was there a quiet moment in a Chinese household especially as aunties gathered who all possessed the family trait of high sopranos voices, which were probably even evident miles down the road. There was a lot of sharing and family members’ participation involved as each had their own role and individual strength or skill, for instance folding the bamboo leaves with stuffing and tying a cluster of them to strings. We appreciated and respected each others’ roles even the children, like myself back then were delighted eating after witnessing the hours of making Zong. I am proud of my family and have realized that preserving the food heritage is vital in creating one’s identity and shaping the next future generations’ love for the family’s traditions. So what is my favorite Zong? And who makes the best Zong in Malaysia? Determined, I attempted to re-make Zong according to my grandma’s recipe some months ago. I pulled some family members together and took a few quick decisions to speed things up. The outcome was a disaster the taste, texture, everything fell short of what I was used to. There are no shortcuts to traditional recipes and there are some things in life that are irreplaceable. Every traditional food has its story and listening to it takes you a step closer to a deeper understanding of its culture. True meaning makes every bite unique in its taste and even more pleasantly delicious to savor till the very last bite. So I urge all to continue this tradition! 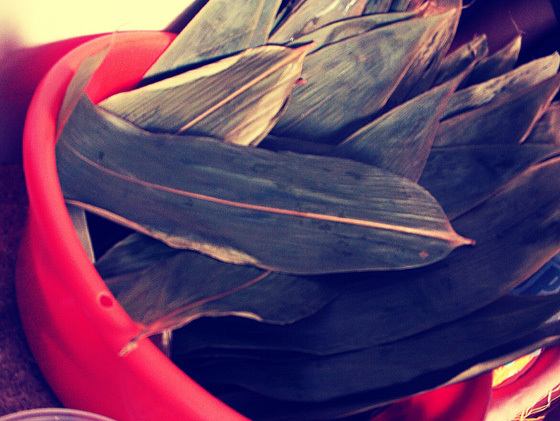 Head out and buy some Zongs to eat in this time of the year. Happy Tuen Ng Jit (Zong / Dumpling Festival). 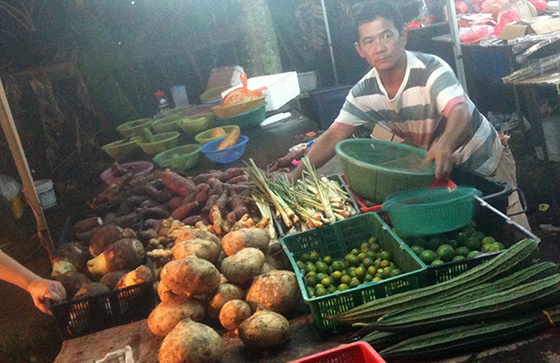 Curious to find out where to buy the best Zongs around Kuala Lumpur? Visit http://www.simplyenak.com/zong-chinese-dumpling-festival-malaysia to find out more. This article was written by Pauline Lee. Pauline is a food enthusiast and has a great passion for Malaysian Food. Her mission is to preserve local food traditions and recipes to allow next generations to enjoy what she knows to be some of the world’s best food. Pauline is a Food Experience Captain and owner of Simply Enak – Food Experiences. 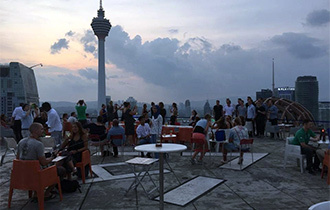 Her company aims to give foreign guests the best experience of Malaysian Food. Simply Enak provides food walks, food drives, dinners at local homes and more exciting Food Experiences. Visit http://www.simplyenak.com for more information.